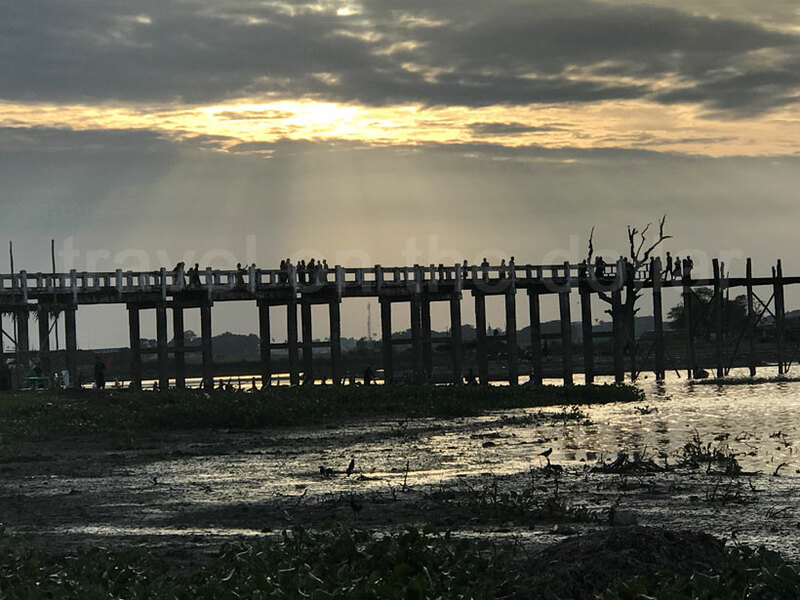 All the sights in Mandalay are spread across this second largest city and walking to all of them is not possible. Considering the traffic of Mandalay, the best and cheapest way to see all the sights is to hire a bike-taxi. Prices vary largely depending on whom you ask, and most hotels will arrange a bike-taxi for you. 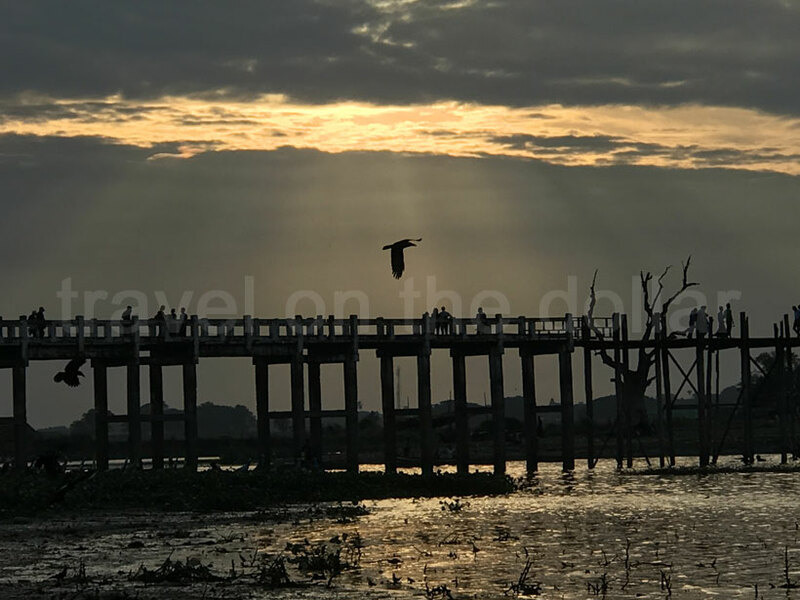 A day of sightseeing in the city itself (north and south sights) should cost around MMK 10,000, but a three-city tour (Sagaing, Amarapura, Inwa) costs about MMK 15,000-20,000 for the day. I hired one for MMK 13,000 per day, for two days, through Golden City Light hotel where I was staying. The driver picked me up at the hotel at 8am for the ferry to Mingun. 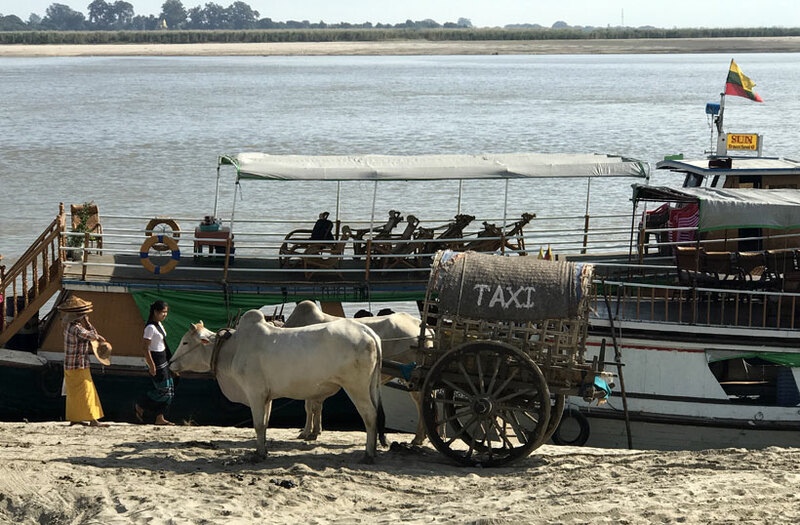 One ferry a day costs MMK 5,000 (return trip), starts at sharp 9am from the Mingun ferry dock in Mandalay and takes 45 minutes across the river. 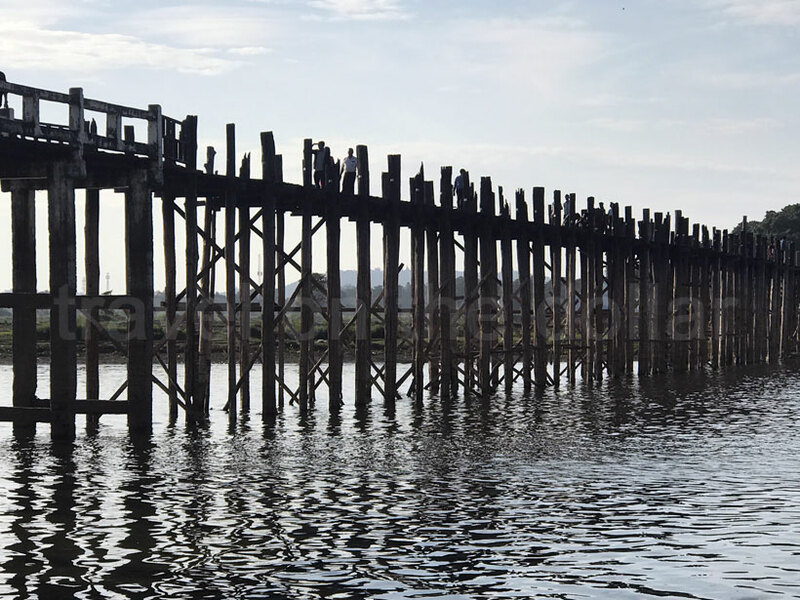 The return ferry is 12:30pm which gives you ample time to visit the sights of Mingun. 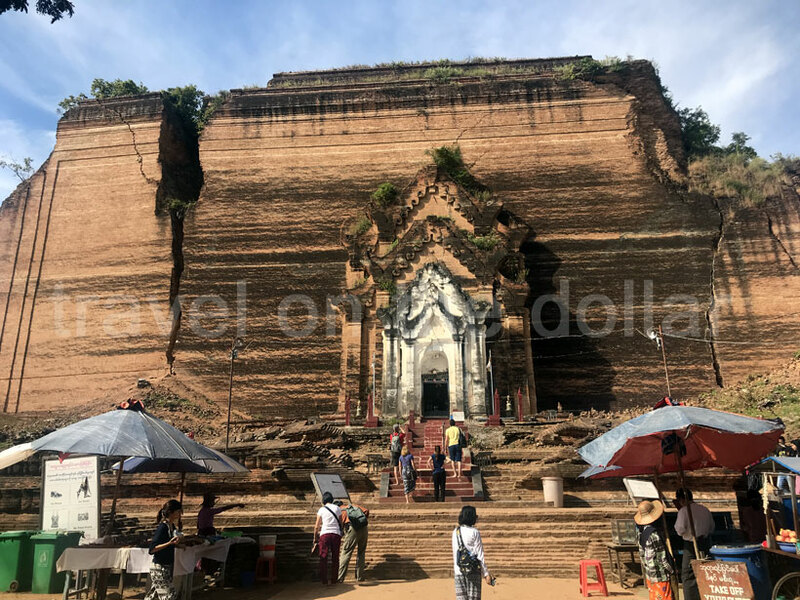 Upon landing in Mingun, foreigners are required to pay MMK 5,000 as fees to visit the temples & pagodas. This ticket is checked at most of the sights. 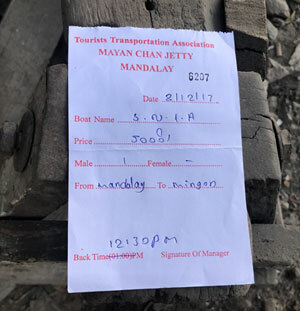 Important note on Mingun fee – The entrance fee of MMK 5,000 is sold at the counter located next to the Mingun ferry dock. 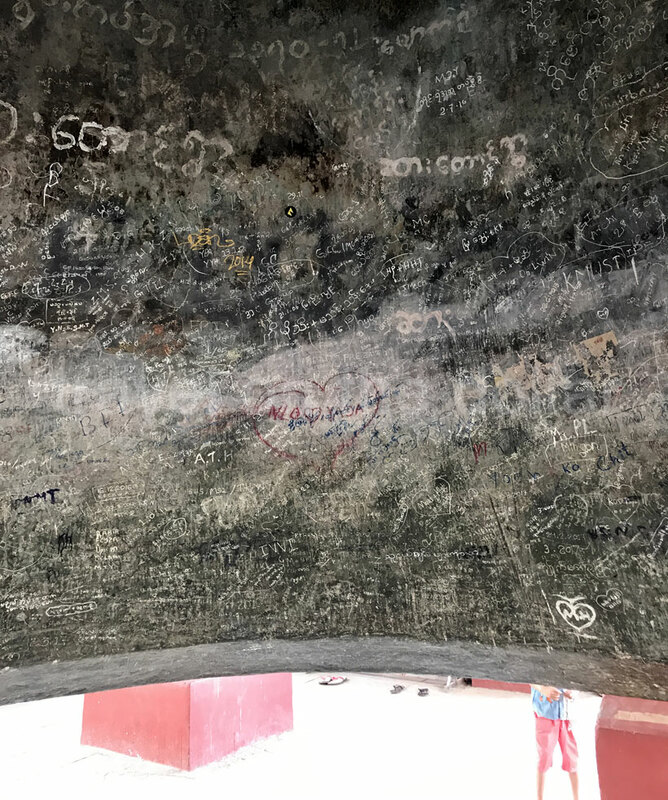 If you are able to walk past the counter without purchasing the ticket and go to the pagodas, then you will be required to go back to the counter to purchase one as guards check the ticket at all the spots. 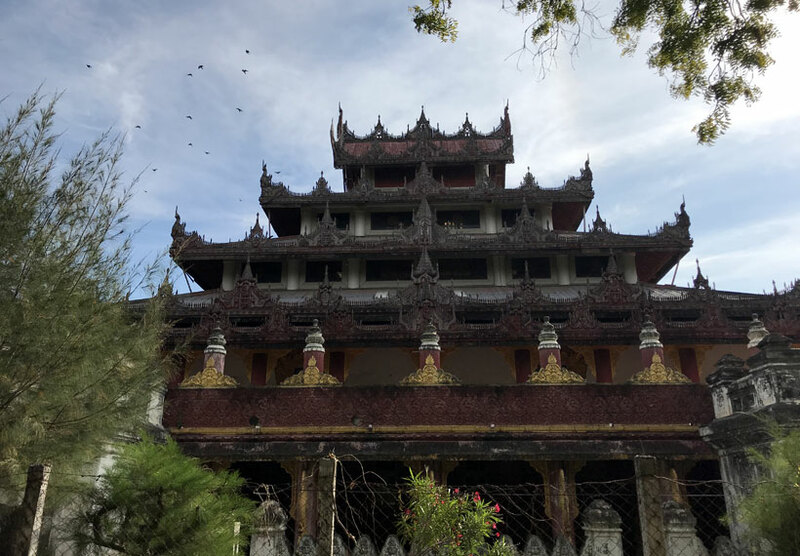 The first sight in Mingun is Sat Taw Yar Pagoda located at the banks of the river. 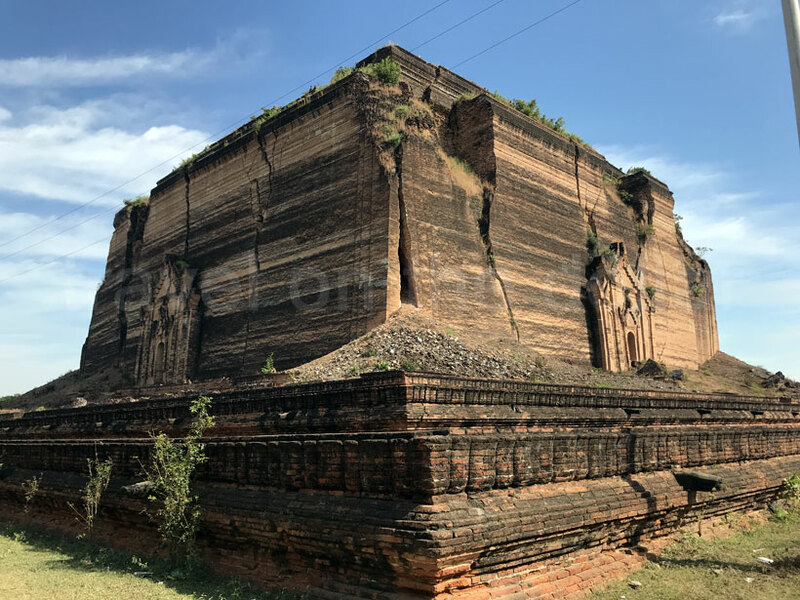 A few meters further are the remains of two giant Chinthe lions about 29 meters high, guarding the Pahtodawgyi temple. 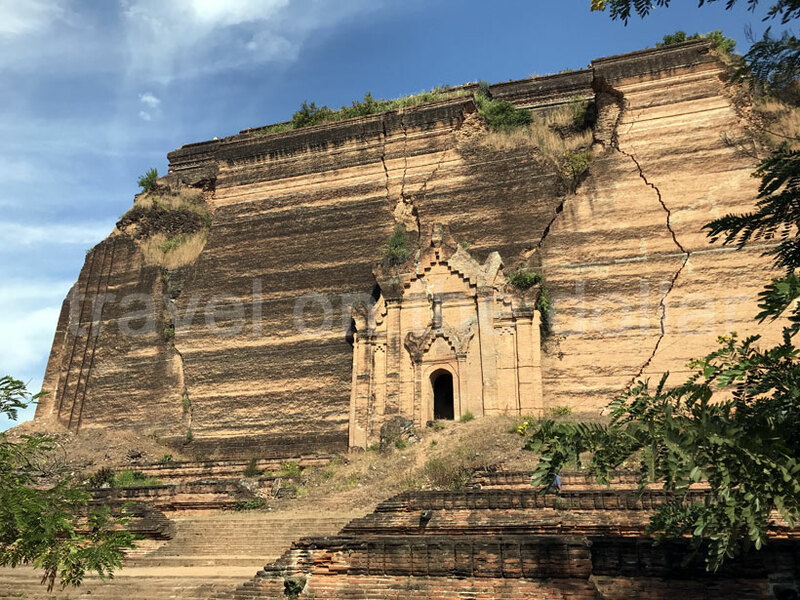 One of the most elegant temples in Myanmar is the unfinished Pahtodawgyi temple (or Mingun Paya). 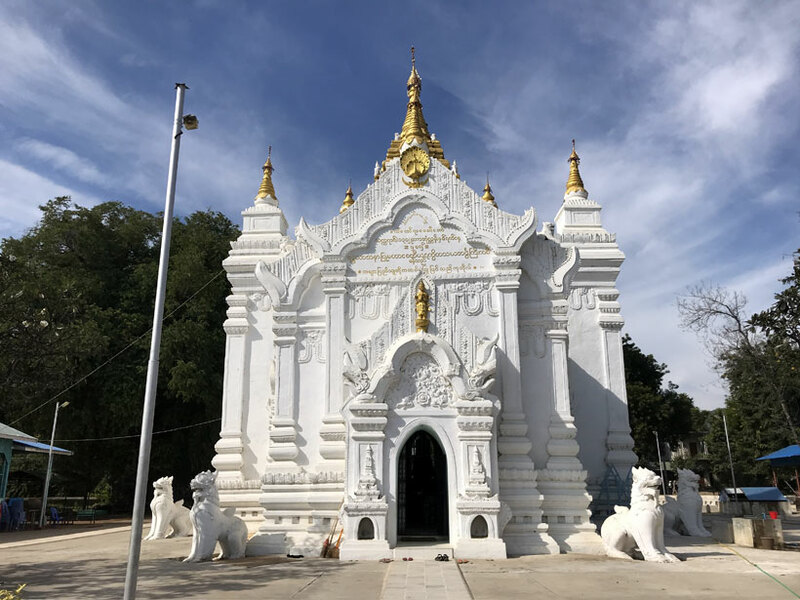 The stupa was started by King Bodawpaya in 1790 and was not completed because an astrologer claimed that once the temple was finished, the king would die. The completed stupa would have been the largest in the world at 150 metres (490 ft). Huge cracks are visible on the structure from the earthquake of 23 March 1839. 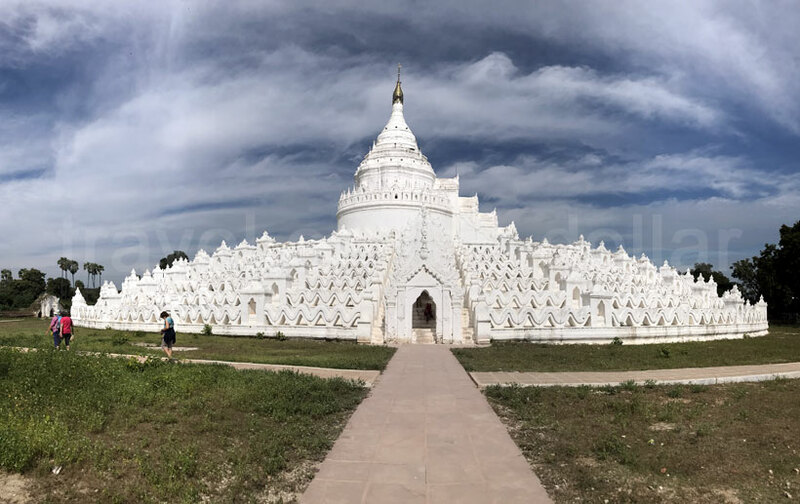 Like many large pagodas in Myanmar, a pondaw paya or working model of the stupa can be seen nearby. 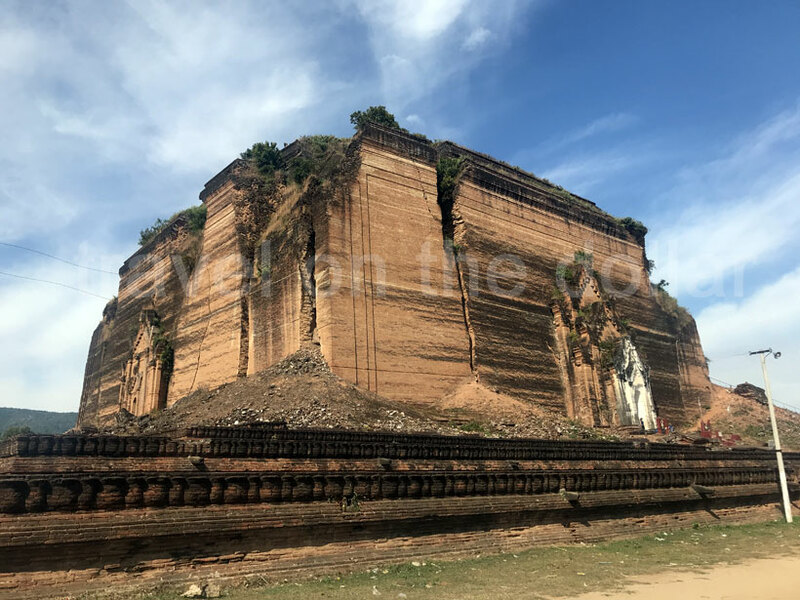 King Bodawpaya also had a gigantic bell cast to go with his huge stupa, the Mingun Bell weighing 90 tons, and is today the largest ringing bell in the world. 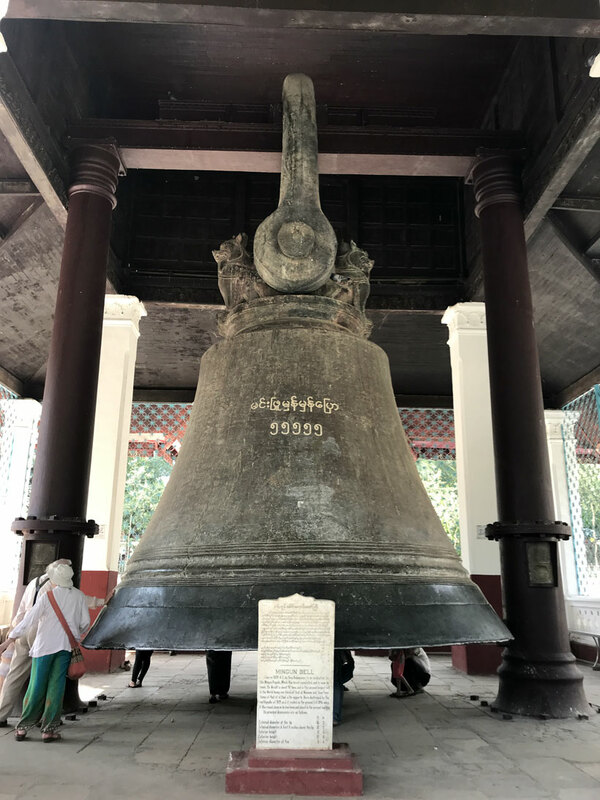 The weight of the bell in Burmese measurement, is 55,555 viss or peiktha (1 viss = 1.63 kg), handed down as a mnemonic “Min Hpyu Hman Hman Pyaw”, with the consonants representing the number 5 in Burmese astronomy and numerology. 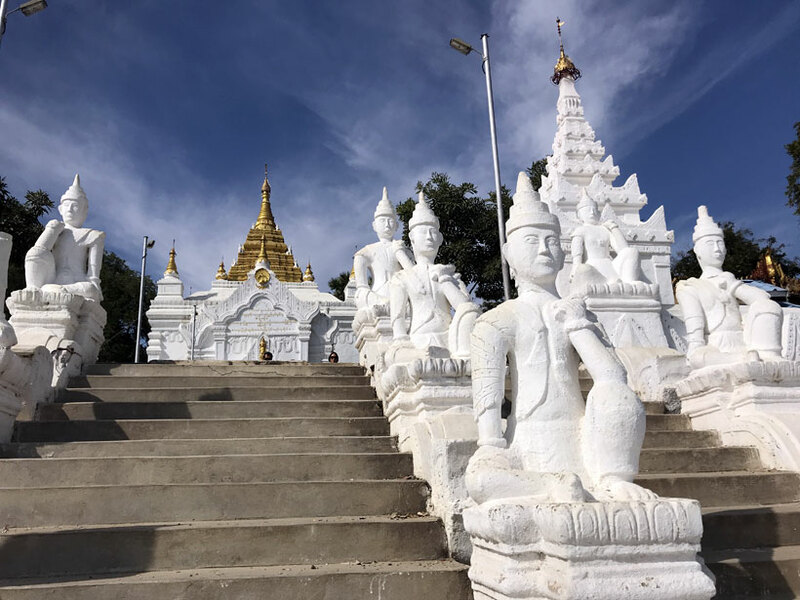 Another 5 minutes walk further from Mingun Bell will bring you to the striking 19-century white pagoda, Mya Thein Tan pagoda (Hsinbyume Pagoda). After succeeding the power from his father, King Bodawpaya, the Prince Bagyidaw decided to built this pagoda as a mark of his reign, in 1816. It was completed three years later in 1819, coinciding the time he officially ascended the throne and became King of the Konbaung dynasty. The structure was named after the King Bagyidaw’s first wife, Queen Hsinbyume, whose name literally can be translated to White Elephant Queen. The Queen died after giving birth to the King’s first child. To fund the construction, the King used 100.000 emeralds, hence the name Mye (Emerald) Thein Tan (100.000). 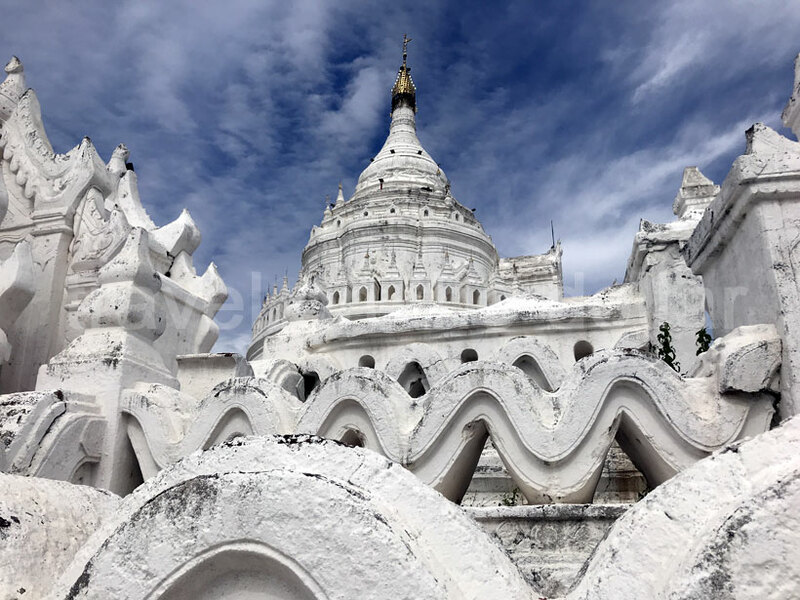 During the destructive earthquake in 1838, the Hsinbyume Pagoda was seriously damaged and only was it restored by of a successor King. 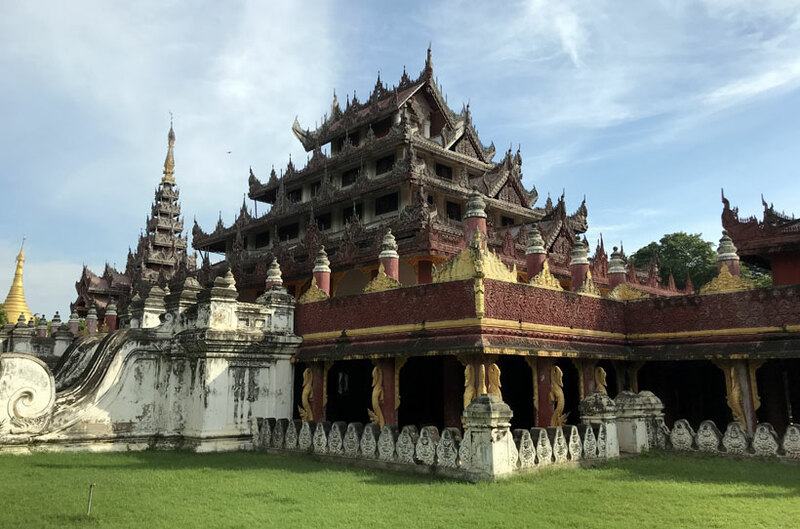 The pagoda owns a very distinctive architectural style, compared to other pagodas in Burma. 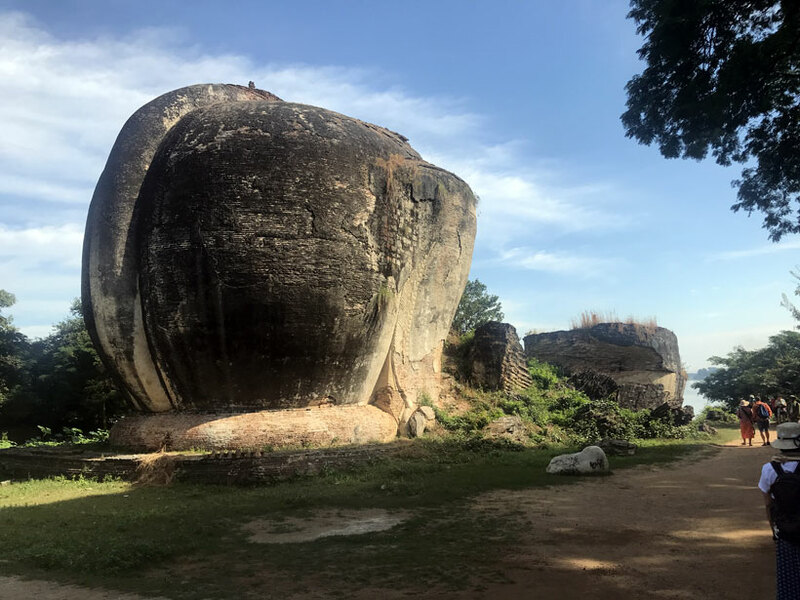 At tha base of the structure reveals circular terrace shape representing the seven mountain ranges surrounding Mount Meru, the center of the universe in Buddhist cosmology. 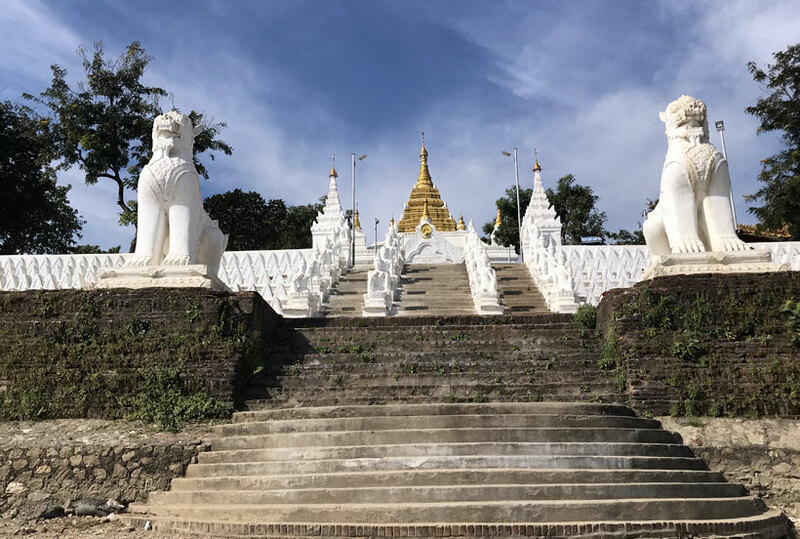 The top of the pagoda is said to be designed according to the style of the Chulamanee pagoda on the Mount Meru which is topped with a gold spire enshrines a Buddha image. 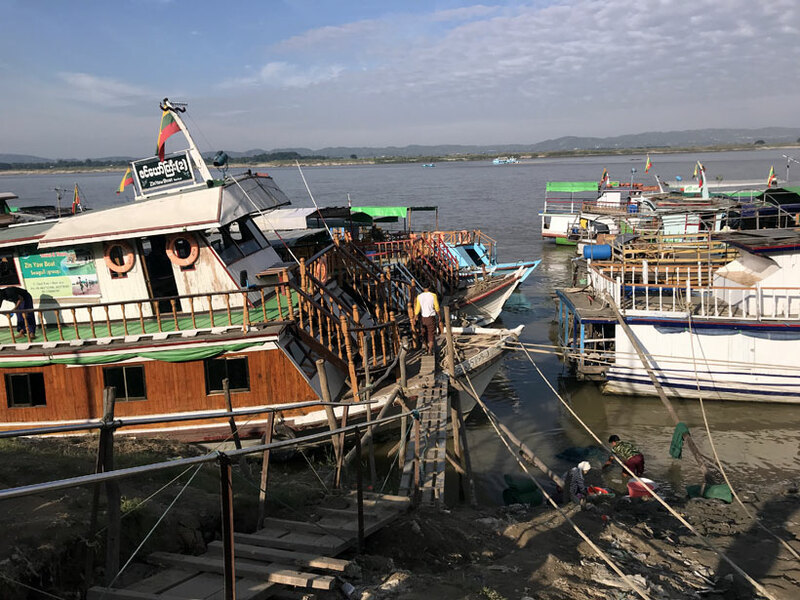 Returning back to the banks of Irrawady river, I took the ferry back to Mandalay, where my motorcycle driver was waiting. 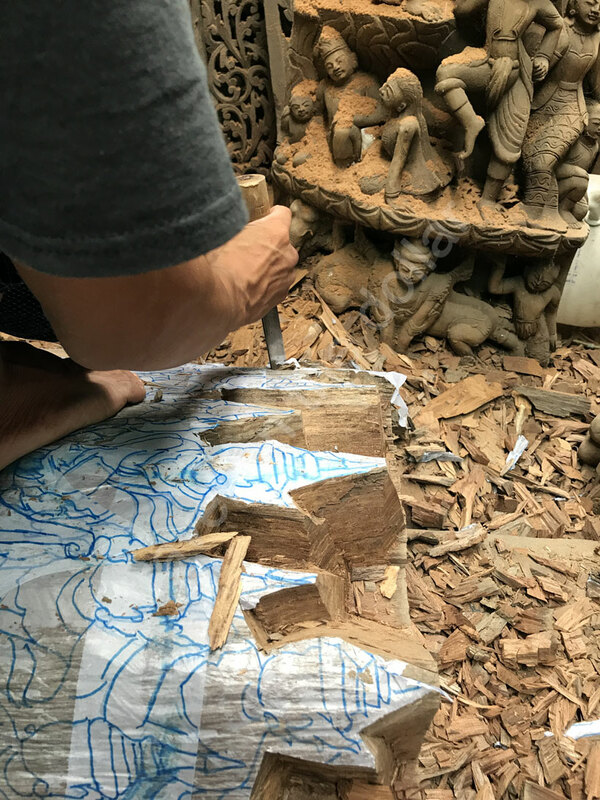 We rode the bike for about 20 minutes to stop at a wood carving shop. 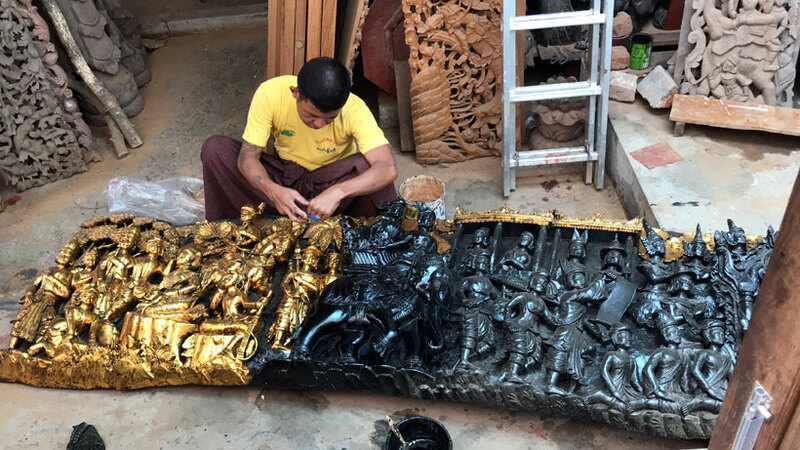 Mandalay is well-known for its wood carving workshops and one of the best places to purchase some excellent work of art. Another 20 mins ride brought us to a local restaurant for lunch. 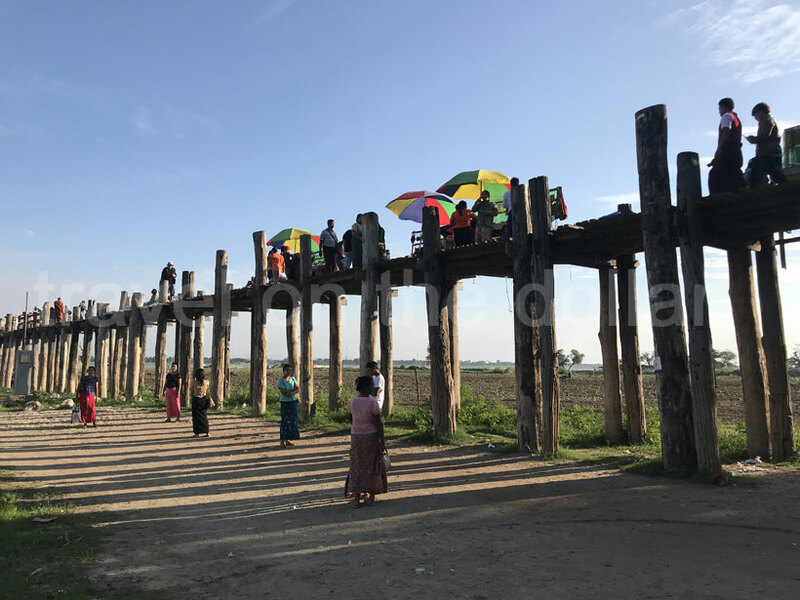 I had planned to visit the temples and pagodas of Mandalay the next day, so the one last thing to visit for the day was U-Bein Bridge. But it was past 2pm after lunch, so we stopped by a monastery on the way to the bridge. 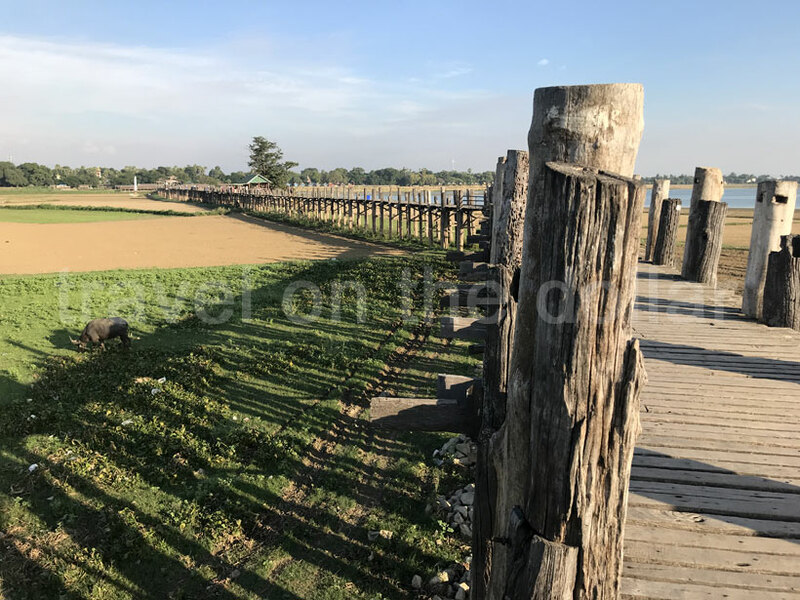 U Bein Bridge is a 1.2km wooden bridge built by the British during the colonial days in 1850 and is believed to be the oldest and longest teakwood bridge in the world. It is especially striking in the evening when the colors of the sunset paint the scene in natural color. This of course means that the bridge becomes more crowded during those times. You can hire a boat for MMK 11,000 per boat; especially during sunset for some stunning views of the bridge. But for one of the best spots for excellent sunset pictures of the bridge, walk across the bridge to the middle portion where there’s a small island. 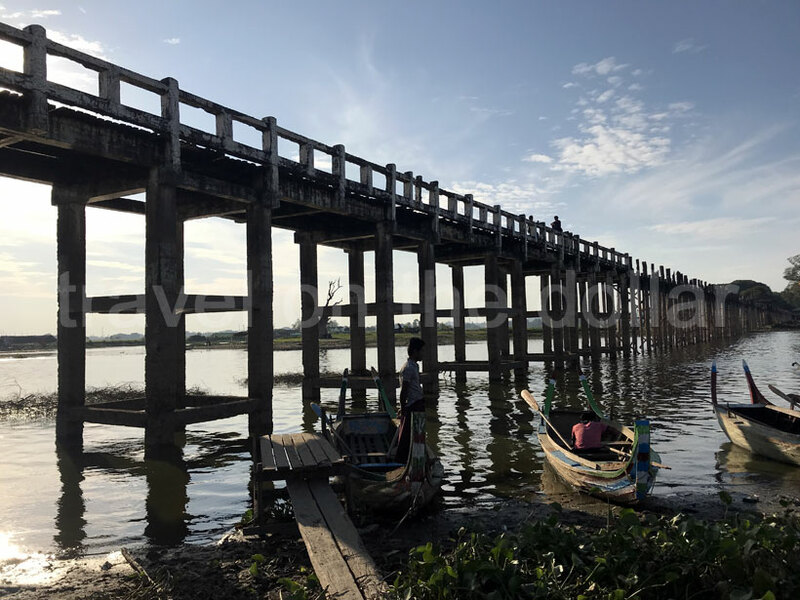 Take the stairs down on the left (in direction to Amarapura) where you’ll find cafes. On the island, walk to the right and follow the path around the river to the banks from where you can get perfect sunset views. Remember that this place gets full as sunset nears so make sure to reach early and get your spot! Also, the path leading to the banks can get muddy and slippery depending on whether it has rained, or the level of the river. A 45-minute drive brought me back to the hotel. A quick refresh and I stepped out for dinner before calling it a night! Dinner $3.70 MMK 5,000. At ‘Diamond Ring’ restaurant.